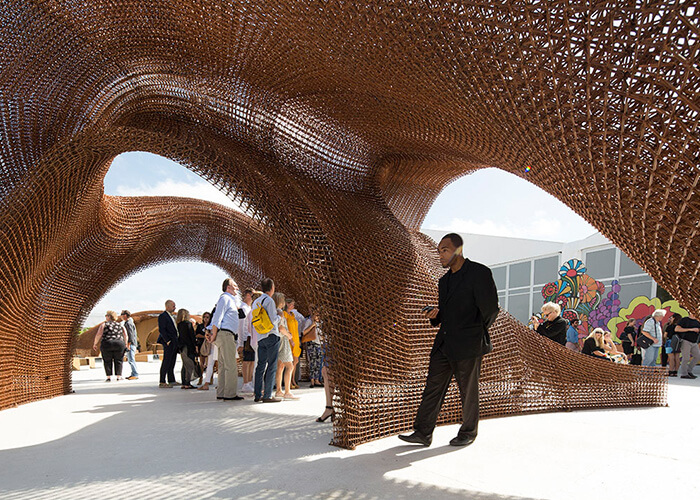 Not long ago, 3D printing in construction was the realm of small-scale hobbyists and design competitions. Those days are quickly fading from view. In June, for example, Eindhoven University of Technology announced Project Milestone, a plan to 3D print a series of obeliscal concrete homes designed by Houben & Van Mierlo Architecten—an endeavor described by the university as “the world’s first commercial housing project based on 3D printing.” And housing is just one aspect of a market that one industry report predicts will grow from $70 million in 2017 to $40 billion by 2027. The construction industry has turned to 3D printing to realize complex shapes, build in dangerous or remote areas, and reduce material waste and onsite construction costs, among other benefits. As the software and equipment for 3D printing improves, legacy construction companies and startups alike are recognizing its potential for real-world fabrication. Here are a few use cases that are shaking up the industry. MX3D employed robots, proprietary software, and welding machines to build a 40-foot bridge that will span Amsterdam’s Oudezijds Achterburgwal, one of the city’s oldest canals. Courtesy Thijs Wolzak/MX3D. For a long time, the size of a 3D-printed project was limited by the size of the printer. But the Dutch firm MX3D (tag line: “We Speak Robot”) is using industrial six-axis robots, proprietary software, and welding machines that deposit stainless steel from thin, molten wire to build a 40-foot-long smart pedestrian bridge spanning the Oudezijds Achterburgwal, one of the oldest canals in Amsterdam, dug in 1367. Designed by Joris Laarman Lab in collaboration with Arup and supported by Autodesk, ArcellorMittal, Heijmans, Lenovo, and other partners, the bridge is undergoing structural validation testing at Imperial College London. 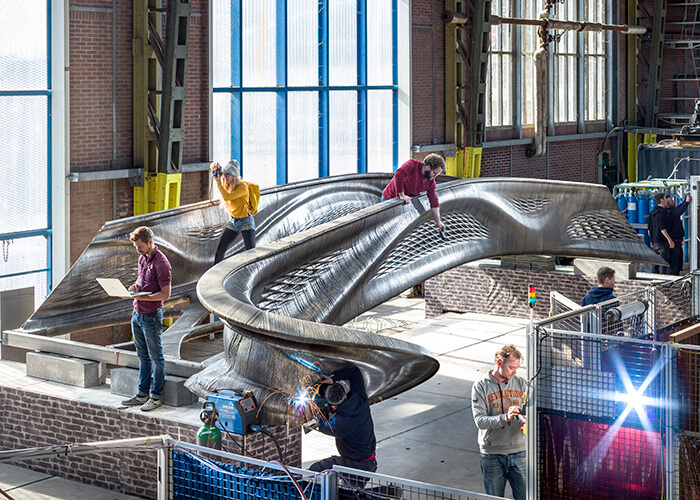 “Validating a bridge as novel and experimental like this one requires a method that is completely new,” says Tim Geurtjens, co-founder and former chief technical officer at MX3D. “The modern traditional way is to do everything digitally. You make a design, test it with a software package, and put a stamp on it according to regulations. But there is quite a bit unknown about material properties of printed forms.” MX3D aims to trial the load capacity of a physical model at various points, such as the handrails, to make precise adjustments. 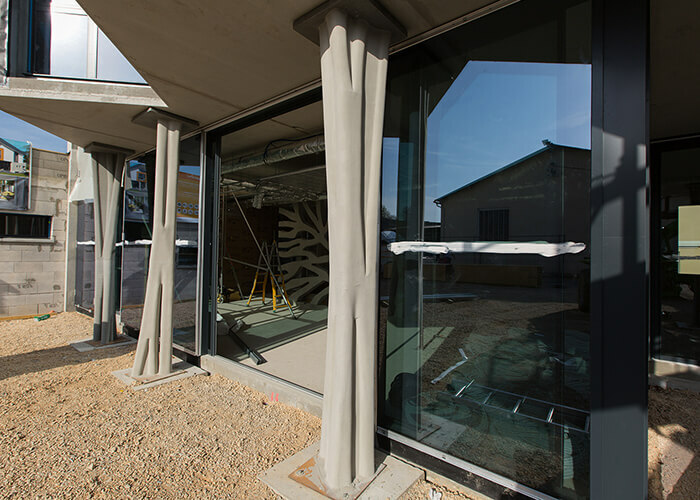 XtreeE, one of 18 partners collaborating on the YRYS Concept House, created support pillars (shown) and a perforated wall for the experimental housing structure. Courtesy XtreeE. For 3D-printed homes, construction companies are rushing to claim superlatives: the largest, the most quickly built, the cheapest, the most materially efficient. Designs are emerging from all corners of the globe, such as Russian firm Apis Cor’s spartan concrete house, which the company says it built in 24 hours for $10,000; and Chinese firm Winsun’s five-story apartment block, produced with a behemoth waste-recycling printer. One of the most intriguing projects is the YRYS Concept House being built by 18 partners, including French construction company Maisons France Confort and large-scale 3D printer company XtreeE. Using injection molding to press layers of rapidly setting concrete, XtreeE created a perforated wall and four structural columns supporting the upper floor’s rooms. XtreeE and Seaboost modeled irregular tunneling shapes in a porous concrete “reef” to encourage the return of displaced marine species. Courtesy XtreeE. XtreeE is also producing what it calls “the world’s first 3D-printed concrete artificial reef.” Partnering with the marine engineering firm Seaboost, XtreeE designed and manufactured a porous concrete system to restore a lost ecological habitat at Calanques National Park in the Mediterranean Sea, off France’s southern coast. 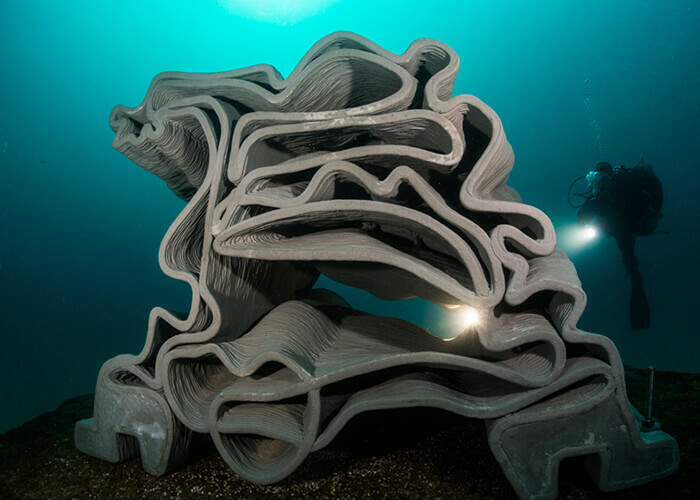 Kuhn says the irregular tunneling shapes of the 3D-printed artificial reef have been modeled to encourage the return of species of fish, algae, mollusks, and coral populations that began to decline in the 1970s and 1980s due to wastewater emissions from the city of Marseille. The “reef” replicates the pockets and caves of the original limestone substrate, giving vulnerable species protection from predators. Nashville’s 20-foot-tall OneC1TY lattice bandshell structure can withstand a foot of snow and 90-mile-per-hour winds. Courtesy Branch Technology. 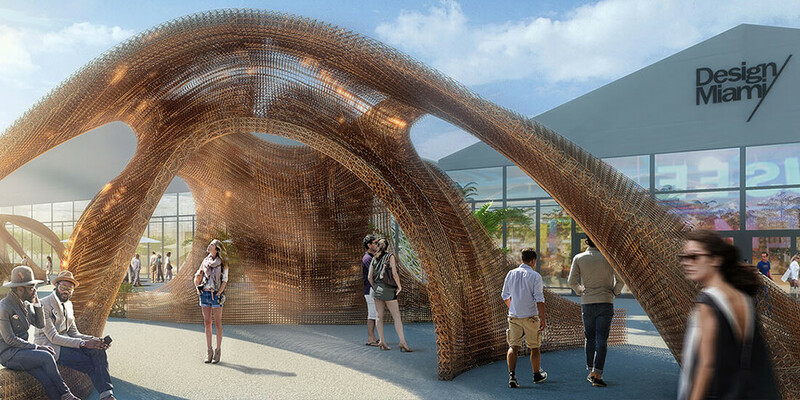 In June 2018, the firm unveiled reportedly the largest 3D-printed structure in the world, a 42-foot diameter, 20-foot tall bandshell for OneC1TY in Nashville. The lightweight carbon-fiber structure, commissioned by Houston developer Cambridge and designed and built in partnership with CORE Studio’s Thornton Tomasetti, complies with Nashville’s building codes, which require it to withstand one inch of ice buildup, 10–12 inches of snow, and 90-mile-per-hour wind loads. Discover the exciting history of 3D printing in construction. Though initial analysis suggested that the large spans would require steel substructures for support, subsequent studies showed that a curvilinear geometric design could eliminate the need for steel except at the foundation. This meant the project could remain within budget, at roughly half the cost of a similar steel structure.